Heading to a campground could often be an issue depending on where you’re traveling. 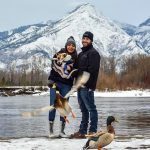 But, the rule of thumb to follow is that campgrounds of any state in the US can house motorhomes that are under 27 feet. 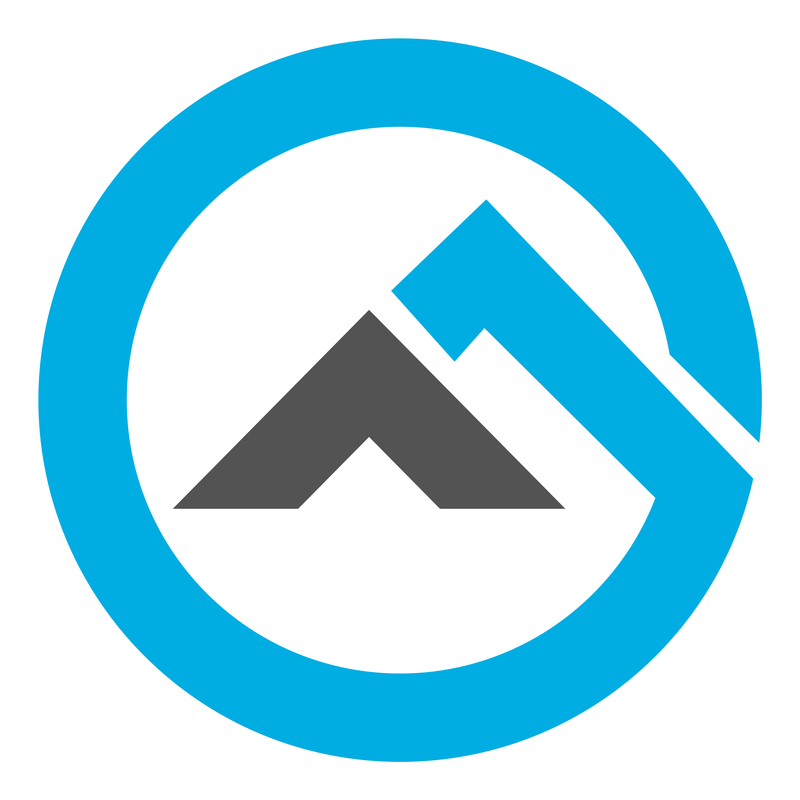 With that in mind, RVingPlanet has compiled a list of the top 5 best small motorhomes for campgrounds. Read on to find out which are the favorites! 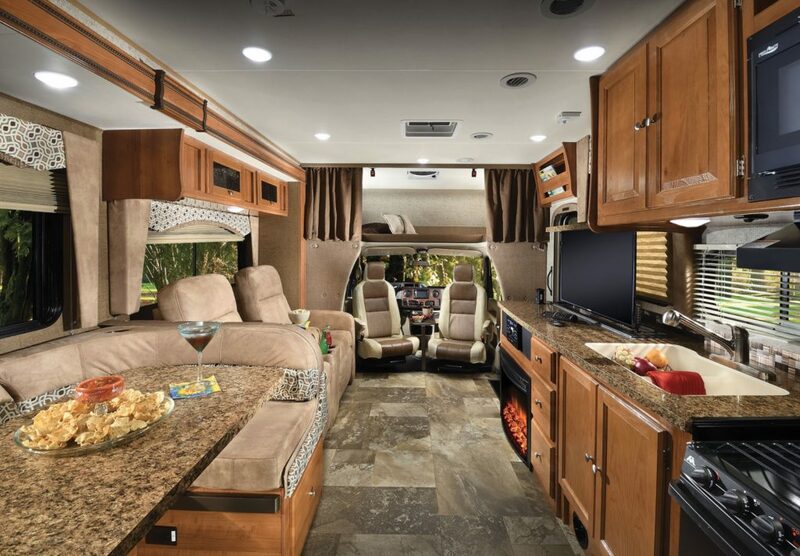 What puts an RV on the list: Apart from being under 27 feet, RVingPlanet has also taken a look at a motorhome’s reviews, ratings, critic opinon and their recent models to give you the most updated information available right now. 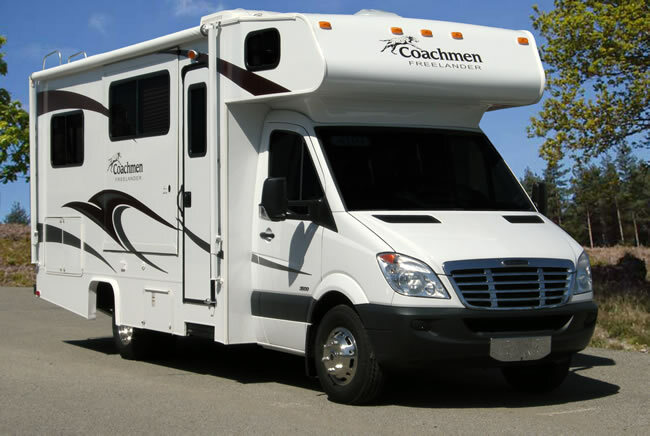 When it comes to finding a class C that you could park in a campground, few could be as good as the Coachmen Freelander. Most of the floorplans available are pretty lightweight as well. Tipping the scales at the lowest is the Freelander 20CB and the heaviest being the Freelander 31BH Ford 450 at 12728 pounds. You don’t sacrifice on the sleeping capacity either, as it can house as many as 8 people, making this a suitable camper for both couples and people looking to camp with their friends! As far as features go, the Freelander offers quite a lot which one would associate with a premium motorhome. This applies to both the convenience based features (such as an even-cool AC ducting system) and the looks (which include the nutmeg wood grain cabinets). 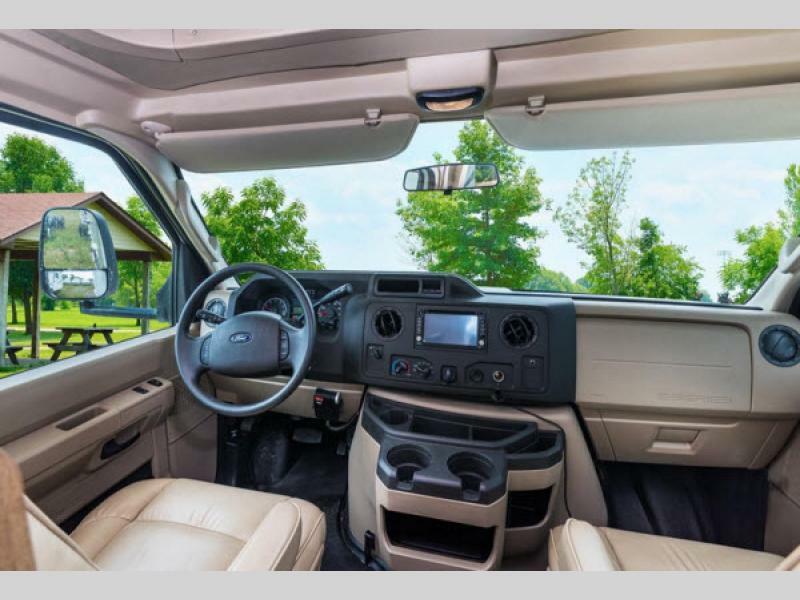 This, in combination with the variety of options available, makes us recommend the Coachmen Freelander as one of the best motorhomes for campground. 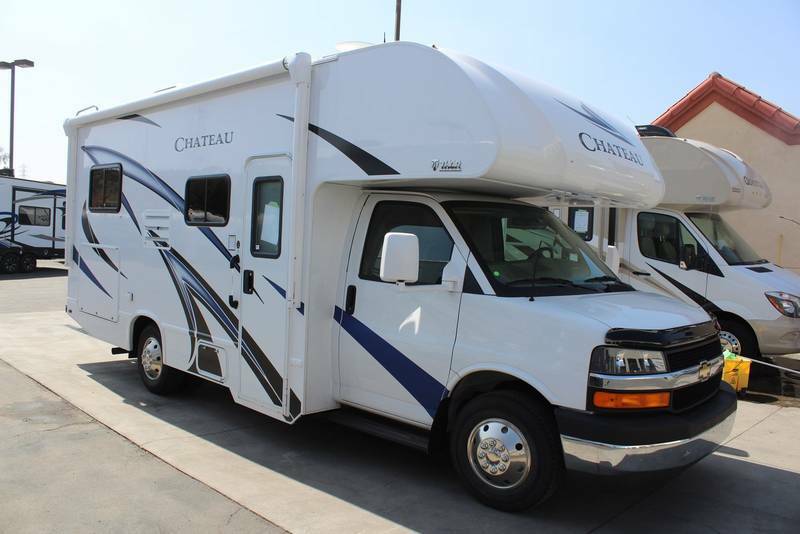 Mention to motorhomes, you’ve probably heard of the Class C Thor Chateau some times before. This goes without saying that Thor has made a one-of-a-kind camper here, even with its high standards. 23 floorplans offer many choices in sleeping capacities between 4 and 7 people. 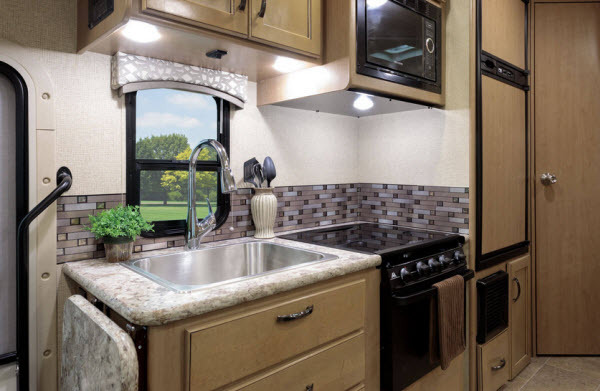 Not to mention that it has 9 floorplans that are under 27 feet and thus suitable for campground such as the Chateau 20CB Ford and the Chateau 21QB Chevy. Heading to the features, the Chateau sports aluminum sidewall construction along with a roof made out of the same material plus a TPO surface. Inside, it has decorative glass cabinet doors and the nutmeg wood grain cabinets that look phenomenal. 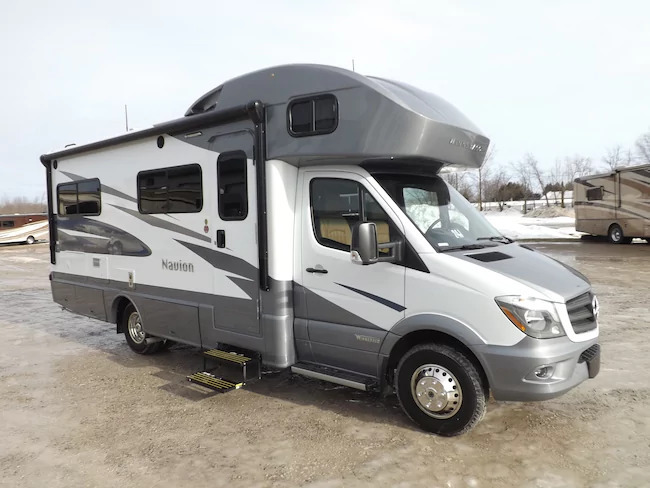 You also have a ton of options available to make this motorhome truly yours. Check out the link for the complete list as it has a truly long one! 23 different floor plans available! Another one from Coachmen’s stables that made the list is the Leprechaun. 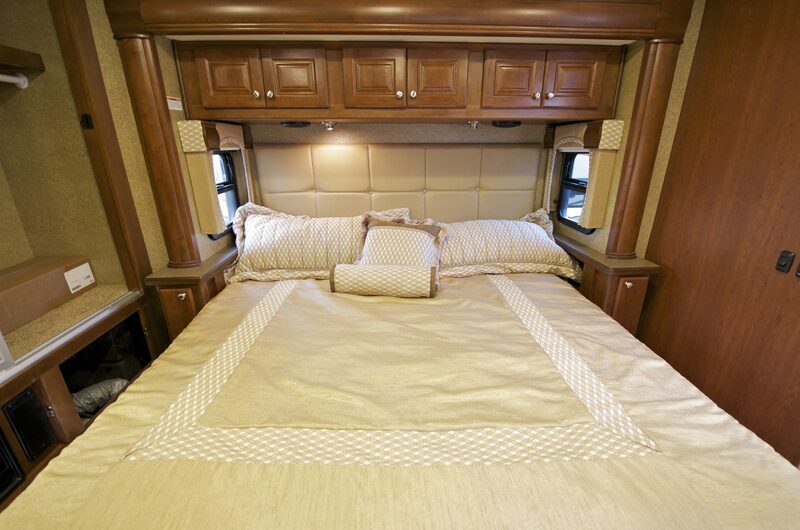 The Leprechaum is also featured in another post about the best motorhomes with bunk beds. 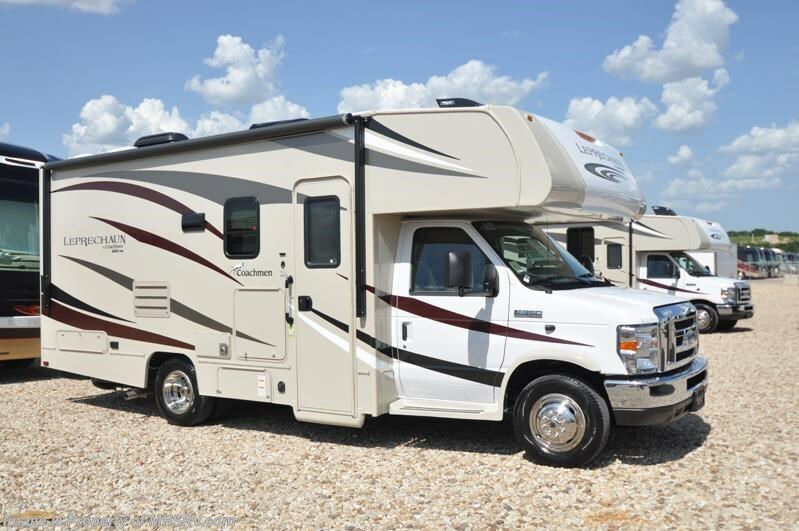 The Leprechaun is quite similar to the other campers here with the exception that it has the highest sleeping capacity of 9 people in the Leprechaun 310BH Ford floorplan. 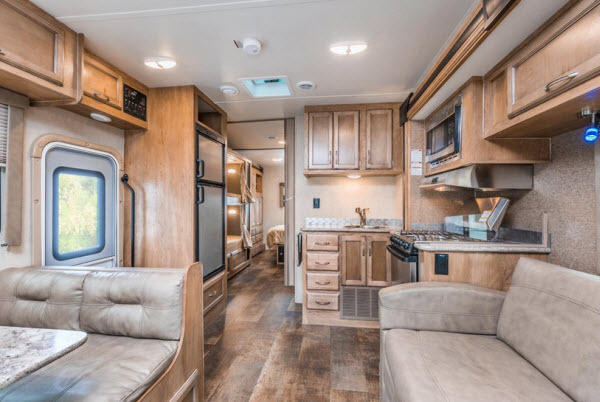 But you’ll probably be interested in something such as the Leprechaun 210QB Chevy, which is an under 27-feet floorplan suitable for campground. The Leprechaun has a lot to say about its features as well. Things such as the exterior TV compartment with receptacle and coax connection or a walkable roof would make ideal for tail gators. If you’re more interested in staying indoors for your trip you can enjoy the comfort of the Jackknife sofa that can be converted into an auxiliary bed and watch some TV. 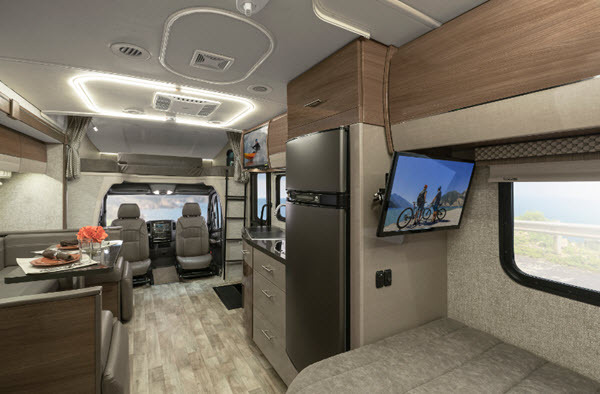 Apart from these, those who have been into camping would like to upgrade this rig, and can do so with options such as an upgraded TV and A/C, slideout awnings, convection microwave and more! In a nutshell, the Coachmen Leprechaun is another one of the best small motorhomes for campgrounds in the market right now! 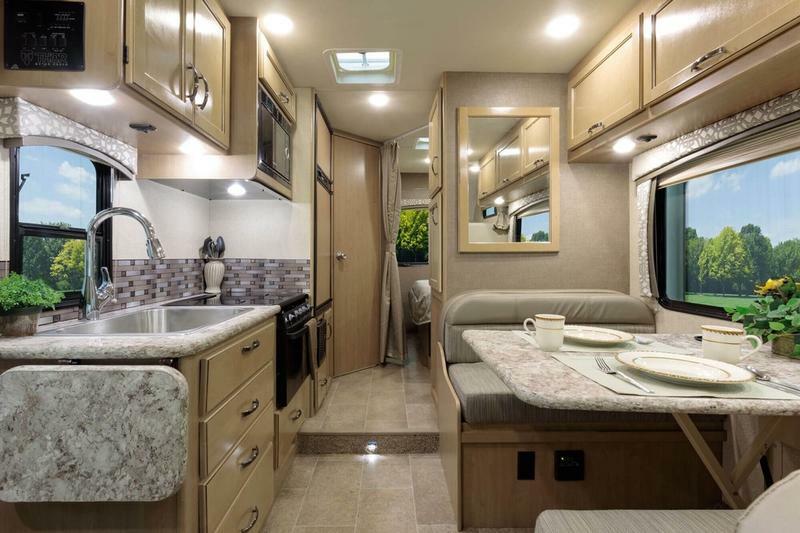 You’ll be hard pressed to find something that’s as versatile as the Gulf Stream Conquest Class C, which is especially impressive for a motorhome that only has 12 floorplans, half of which are actually ones that are under 27 feet in length such as the Conquest 6220. 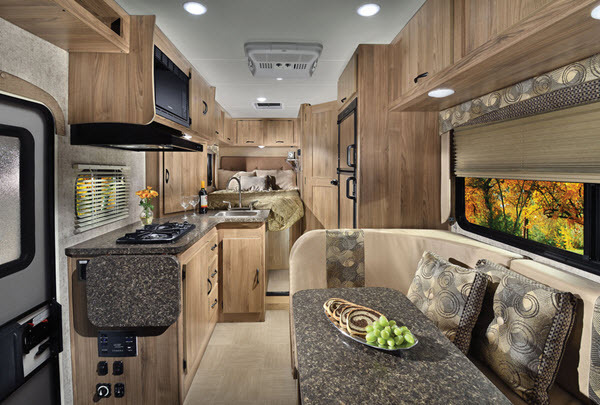 Even the ones over 27 feet aren’t that long, such as the Conquest 6320 spanning 32 feet. The Conquest brings as much to the table in terms of features as it does in terms of specs. This is confirmed when you take a look at the furnishing such as the soft-touch vinyl jackknife sofa, pleated window shades among others. Its also got a decent set of appliances for general convenience and safety such as CO, LP Leak detector and fire extinguisher. 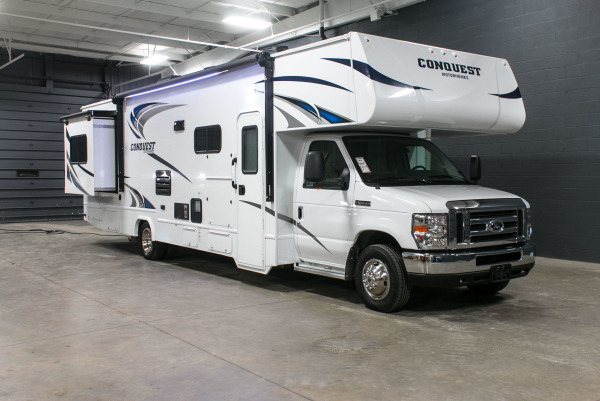 If you want to give it a bit more oomph, the Conquest also has a lot of options such as an upgraded AC, rear window, stainless steel wheel liners and many more! 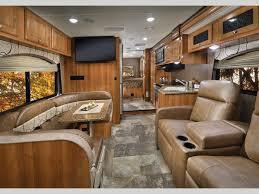 While discussing the popular motorhomes, a particular one which probably goes unnoticed is the Winnebago Navion. There are a good chunk of adventurers and critics who seem to be quite satisfied with its specs and features. This rig has 4 floorplans with nothing different about them in terms of physical specs. For example, there’s no difference between the Navion 6220 and the Navion 6237 with the exception of the layouts. The Navion is also quite impressive in terms of features. Looks or convenience, the Navion has it all. There is a decent 6 cubic feet double door refrigerator to Roanoke light cherry cabinetry for that exquisite look. 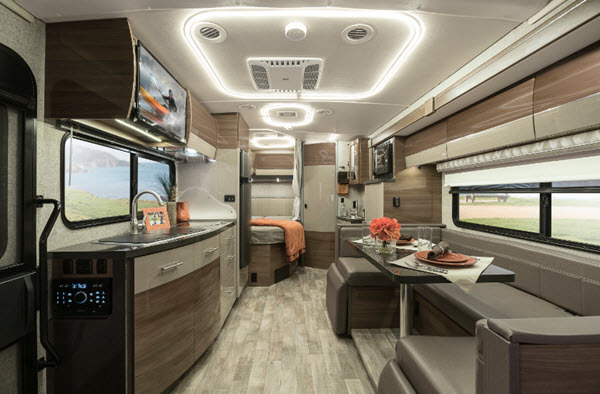 Its capabilities aren’t limited to what you see on paper, as there are many significant upgrades and additions available ranging from remote control mirrors to a 15,000 BTU air conditioner. Thus, it stands to reason that the Navion is probably one of the best small motorhomes for campgrounds. 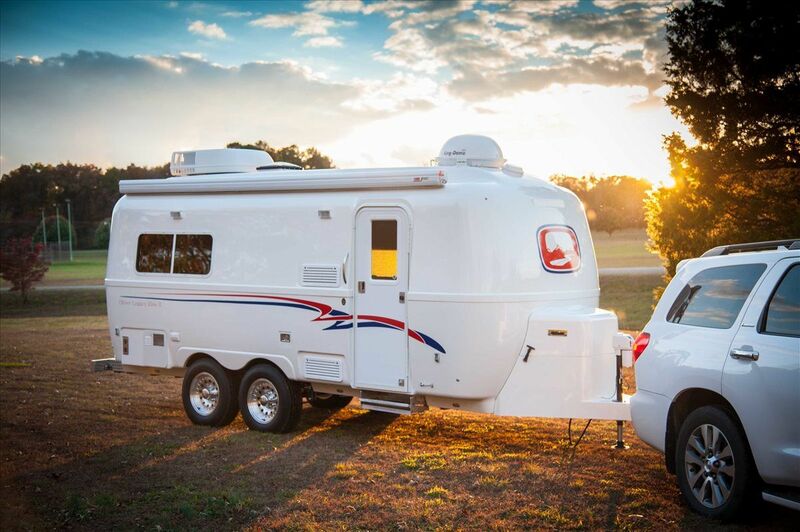 Share with us your favorite small motorhomes for campgrounds in the comments below!